Articles focusing on a particular aspect of Open Innovation or a company. Using an Open Innovation platform can improve your technology intelligence and accelerate innovation within your company by offering access to the right experts and knowledge at any time. ideXlab provides as a multi-service platform the opportunity to leverage the scientific community. On ideXlab’s platform you can find companies, experts and acadamics researchers. You can also analyse hundreds of millions of publications and patents. Find, identify and rank experts relevant to your needs within among 10 million identified individuals or companies. In this second video you will go more deeply in platform’s functionalities, simplicity and search potential. It shows a use case related to ceramic parts additive manufacturing. This case illustrate searching for new technology to improve the manufacturing of ceramics parts by using new additive manufacturing techniques or by using substitute materials. If you are ready to try Open Innovation and identify the best experts to solve your technical question, you can start now and open a trial account that includes 10 search credits on our website. Marking a break with « Closed Innovation » and its long gone paradigm that enabled the multinational companies to internalise their R&D resources and establish their technological supremacy, Open Innovation revolves around a new type of process for companies. To face today’s professional environment’s metamorphosis, where experts become more mobile every day, universities have an increasing role in the business world, and there are more and more research labs, companies crucially need to turn to alternative innovation processes. Participative innovation in a company prescribes the use of internal and external resources and knowledge, so as to increase the research and development’s productivity and efficiency. What are the 8 crucial dimensions of participative innovation to take into account for your company? The process of participative innovation, as a profound transformation, impacts every level of the company, from its high-level strategy to its funding mechanisms and human resources. Open Innovation first of all deeply modifies the internal objectives of the company. This new shift in its paradigm even transforms the way enterprises deal with their market: they have to define new goals to reach and renew their communication process, externally as well as internally. • Which new resources should I recruit? • What are consequences of participative innovation on my R&D budget? • Which tools are crucial to implement this new model? 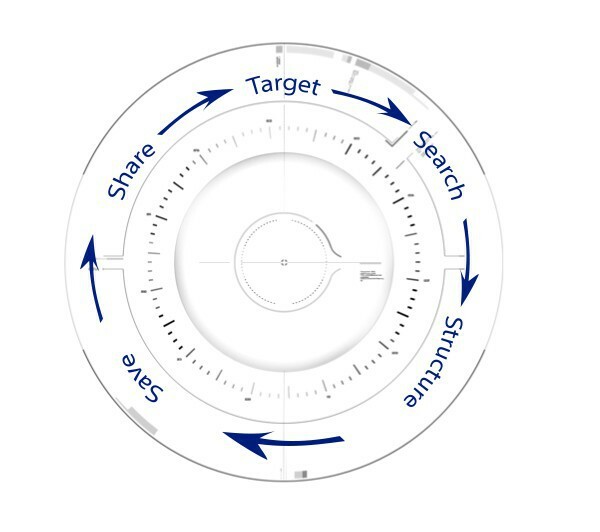 In this White Paper, through the explanation of various concepts concerning participative innovation, you will discover the way internal process of a company will be affected by this new lever of growth. You will also understand why and how to renew your organisation, and the way your company’s ecosystem functions as a whole. [Infographic] What is Open Innovation? Open Innovation is a concept that turns our traditional idea of innovation upside down. According to John Seely Brown, Director Emeritus at the Palo Alto Research Center, we need to go further into invention by “innovating innovation“. The way of innovating needs to be challenged. More than just a new creation, innovation is an invention efficiently brought to a market. With the idea of innovation being brought to a specific market, companies can no longer work without Open innovation if they are eager to go further into creation. Indeed, each company can benefit from external intelligence and contributions, whether they are coming from academics, researchers or experts in a leading-edge technology field. Collaboration with outsiders can help your company renew its model and develop disruptive products or services. How does Open Innovation work? Thanks to Open Innovation, working in a sector with many actors, whether they belong to universities or businesses, is no longer a problem since they can help you grow. But how can your company ensure a successful transition from Closed Innovation paradigm to Open Innovation’s one? Find out with this infographic what are the advantages of Open Innovation for your company, whether your are trying to solve issues or working on new technologies. You will also discover the 9 steps to insure a lasting transition to an Open Innovation model. With ideas coming from inside and outside, your business will have the ability to develop new business models for existing products. Go further and discover 6 examples of Open Innovation in practice in our ebook. The concept of bibliography seems reserved for academic work or literary essays. Yet it plays a key role in innovation. Here’s why. A bibliography is a list that references the relevant documentation in a given field. Building a bibliography is an essential act in any action aimed at advancing knowledge. Justify that new knowledge is produced, such as in the case of a doctoral thesis or a patent that need to clearly identify in the bibliography pre-existing knowledge to highlight the originality of the thesis, or the novelty or inventive nature of the patent. We will not comment using the bibliography for other uses such as measuring the academic performance: it would require a separate development. Many tools exist to make it easier for students and researchers in establishing a bibliography. Called ‘reference management tools’, they can facilitate the establishment of a bibliography – under certain codified rules for example in the citations -. EndNote, Mendeley or Zotero are such examples that can facilitate this work of collecting, organizing, saving and sharing the bibliography thus established. In an innovation activity, the bibliography is also essential: to identify the knowledge, e.g. from publications or patents, which allow the emergence of new ideas on a solid and well-documented basis. The production of new ideas – or questioning preconceived ideas – are obviously key in innovation. This approach must be based on good understanding of the pre-existing knowledge. It is well represented for example by the C-K theory, which explains how innovative design relies on and oscillates between Concepts (C) and Knowledge (K). The bibliography is a key contribution to the “K-space” the knowledge space; concepts (C), which generate the need for new knowledge or are derived from pre-existing knowledge, help identify innovation opportunities. In recent years, the rise of Open Innovation, made possible by the development of information and communication technologies, further highlighted the need to integrate existing knowledge – the bibliography – in any innovation flow. It has also stimulated the emergence of new tools. These new tools should both integrate the need for rapid establishment of a bibliography along with quick execution steps. This execution often results in a linking with experts outside the company, who have expertise that the company does not have. Given this new context, platforms specialized in Open Innovation have emerged. They target innovators audiences, at the crossroads between bibliography creation tools and matchmaking, brokerage tools between e.g. innovative enterprises and experts, they have to adapt to these new needs. To allow to quickly establishing a bibliography with sources of relevant and reliable information (the state-of-the art), to collect and organize information, to save it and to share it, but also to fit in a process of innovative design, these are some of the challenges facing these platforms to enable companies to take advantage of Open Innovation. It is this challenge that ideXlab’s platform addresses : to facilitate access to knowledge, to stimulate innovation and accelerate the execution. Available to all innovators audiences: students, passionate individuals, small and large innovative companies. Try it, contact us, your feedback is precious. This video amazes me and makes me laugh every time! The means used by Bobby McFerrin to teach the music are very reduced. He does not speak to the crowd, nor uses words. He just sings and moves on the stage and the appropriation of the music is immediate. A first jump puts the song in movement; a side jump allows people to sing a tone above; a jump on the other side to sing a tone below. Not content with communicating the pleasure to make some music together to his public, Bobby McFerrin makes it with humor and kindness. The absence of words in his teaching is one of the reasons explaining that this music learning works with crowds worldwide. 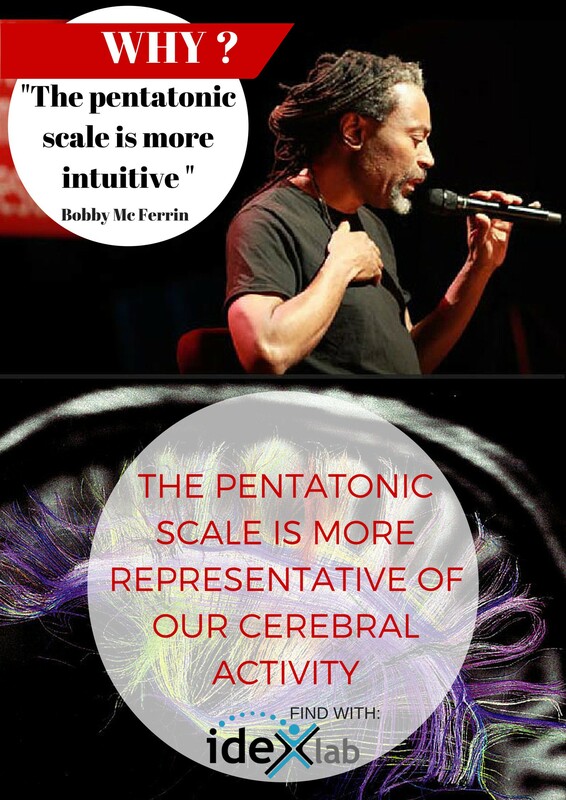 Another reason is probably due to the fact that the music scale used by Bobby McFerrin to get the crowd to sing along is an almost universal scale of five notes called the pentatonic scale. This scale is indeed used, with nuances, in numerous oriental and western music cultures. But Bobby McFerrin is not the only one to be interested in the pentatonic scale. The applications of that exceed music. Science is also interested in it for surprising applications. It is what we discovered by using the ideXlab search engine. The search engine quickly allows to get an idea of the state of the knowledge – what science tells us – in highly varied fields, including those related with music, as for example the last discoveries concerning the pentatonic scales. Let us see an example of what science tells us. A team of neuroscientists at the University of Chengdu and Shanghai Academy of Sciences in China “listen” to the activity of the brain by translating it in the form of music. To do it, they measure the electroencephalogram (EEG) and translate it into musical notes among which the height, the duration and the intensity are calculated by a mathematical processing of the EEG. In recent works, they applied this music production method separately to the right hemisphere and to the left hemisphere of the brain, and then they stacked the melodic lines of both hemispheres. They used successively a heptatonic scale (scale with 7 tones, the most used in western music: do re mi fa sol la si) and a pentatonic sale. Their results demonstrate, by applying this technique to sleeping patients, that the pentatonic scale leads to better differentiation of sleep cycle phases. It also produces music – generated brain waves -which is more harmonious than the heptatonic scale! They don’t comment on whether science so demonstrates that the pentatonic scale is more harmonious or universal than the heptatonic one. Of course, this work does not explain the effectiveness of learning proposed by Bobby McFerrin. But they illustrate the growing links between music and science, be they cognitive, medical, physical, etc. One wonders who benefits from these links: artistic practice, by injection of new knowledge as we have seen in this example about the music, or rather the science which is enriched by poetry and humanity?